Saint Leo University’s College of Arts and Sciences will present its annual Black History Month celebration on Thursday, February 21, at the Newport News Education Office. 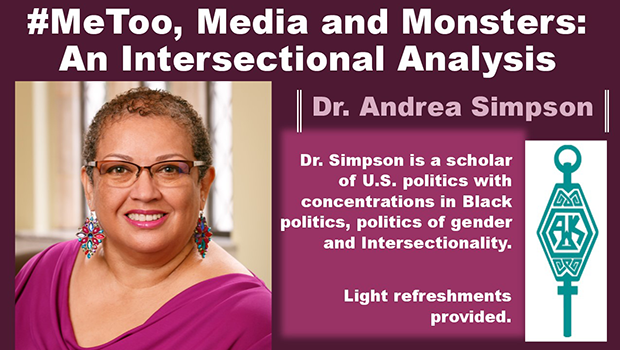 Noted political scientist Dr. Andrea Simpson will present #MeToo, Media and Monsters: An Intersectional Analysisas the keynote address at 6 p.m. The celebration begins at 5 p.m. in Room 203 at the education center, One Bayport Way, Suite 160, Newport News, VA 23606, with presentations by Saint Leo students. They will present short biographies of significant African-American social scientists. At 5:30 p.m., there be an induction ceremony for new members of Alpha Kappa Delta, an international sociology honor society. The public is invited to this free event and refreshments will be served. Not only will students, faculty, staff, alumni, and guests at Saint Leo’s Newport News location be able to participate in this celebration, but the presentation also will be available via livestream to the main campus at 33701 State Road 52, St. Leo, FL, in Room 117 A-B in the Student Activities Building, and at the Gwinnett Education Center in Room 3. The center is at 3555 Koger Blvd., Clarkston Building, Suite 105, Duluth, GA 30096. She received the Distinguished Educator Award from the University of Richmond in August 2015, and the Omicron Delta Kappa Award in March 2013 for outstanding service to students in and out of the classroom. For more information, contact Dr. Eileen O’Brien at eileen.obrien@saintleo.eduor call (757) 249-0390.